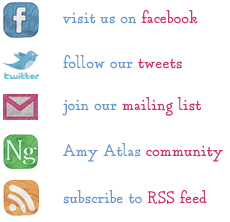 Welcome to AmyAtlas.com (the “Site”). 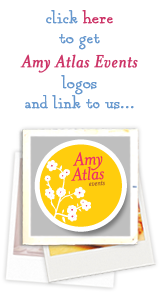 The Site is operated by Amy Atlas Events, LLC (the “Company”). The Company and/or its affiliates provide the Site’s features to you subject to the following conditions. If you visit or shop at the Site, you accept these conditions and agree that you are responsible for compliance with any applicable federal, state, and local laws. Please read them carefully. The Company reserves the right, in its sole discretion, to change, modify, delete or otherwise alter portions of these terms at any time without further notice. Any such change, modification, deletion or alteration shall be effective immediately upon posting the same on the Site. Please check these terms from time to time for changes, as the top of this page will indicate the date these terms were last revised. Your continued use of the Site constitutes your agreement to all such terms, conditions, and notices. In addition, when you use any current or future service or business related to the Site, you also will be subject to the guidelines, terms and agreements (“Terms”) applicable to such service or business. If these conditions are inconsistent with such Terms, the Terms will control. If any of these conditions shall be deemed invalid, void, or for any reason unenforceable, that condition shall be deemed severable and shall not affect the validity and enforceability of any remaining condition. This Site is intended for and directed to adults in the United States only. This Site is not intended for any children under the age of 18. When you visit or send e-mails to the Site, you are communicating with us electronically. You consent to receive communications from us electronically. We will communicate with you by e-mail or by posting notices on this site. You agree that all agreements, notices, disclosures and other communications that we provide to you electronically satisfy any legal requirement that such communications be in writing. The Site’s graphics, logos, page headers, button icons, scripts, and service names are trademarks, or trade dress of the Company in the U.S. and/or other countries. The Company’s trademarks and trade dress may not be used in connection with any product or service that is not the Company’s, in any manner that is likely to cause confusion among customers, or in any manner that disparages or discredits the Company. All other trademarks not owned by the Company that appear on this site are the property of their respective owners, who may or may not be affiliated with, connected to, or sponsored by the Company. Other than Third Party Content (as defined below), all content on the Site, such as text, graphics, logos, button icons, images, audio clips, digital downloads, data compilations, and software, is the exclusive property of the Company (or its licensors) and is protected by U.S. and/or international copyright and trademark laws. Except as expressly provided in the “Limited License” section below, your use of and access to the Site does not grant you any license or right to use any of the Company’s trademarks, trade names or copyrights. The Company vigilantly enforces its intellectual property rights and will actively seek the recovery of any costs and damages it may incur preventing the misuse or misappropriation of its trademarks, trade names, and copyrights. The Site may contain links to other websites (“Third Party Sites”) and merchandise, articles, resources, photographs, text, graphics, pictures, designs, music, sound, video, information, applications, software and other content or items belonging to or originating from third parties (the “Third Party Content”). Such Third Party Sites and Third Party Content, if any, may not be reviewed, investigated, monitored, or checked for accuracy, appropriateness, or completeness by the Company, and the Company is not responsible for any Third Party Sites accessed through the Site or any Third Party Content posted on or available through the Site, if any, including the content, accuracy, offensiveness, opinions, reliability, privacy practices or other policies of or contained in the Third Party Sites or the Third Party Content. Inclusion of, linking to, or permitting the use of any Third Party Site or any Third Party Content does not imply approval or endorsement thereof by the Company. If you decide to leave the Site and access the Third Party Sites or to use any Third Party Content, you do so at your own risk and you should review the applicable terms and policies, including privacy and data gathering practices, of any website to which you navigate from the Site. You acknowledge that by providing you with the ability to access and view Third Party Content on the Site, the Company is merely acting as a passive conduit for such distribution and is not undertaking any obligation or liability relating to any Third Party Content. Certain portions of the Site, such as the “Blog” and the “Community,” allow you and other users accessing the Site to post or upload comments, questions, suggestions, ideas, feedback, names, screen names, pictures, materials, information, or other content (collectively, “Submissions”). Further, you understand that such Submissions may be submitted (or gathered by Company) by way of Third Party Sites, including, without limitation, Twitter.com, Facebook.com and others. You agree that the Company has no obligation to review the Submissions posted and/or submitted by users accessing the Site; that the Company is not in any manner responsible for Submissions; that the Company does not guarantee the accuracy, integrity or quality of Submissions; and that the Company cannot assure that harmful, inaccurate, deceptive, offensive, threatening, defamatory, unlawful or otherwise objectionable Submissions will not appear on the Site. You acknowledge that by providing you with the ability to access and view the Submissions on the Site, the Company is merely acting as a passive conduit for such distribution and is not undertaking any obligation or liability relating to any Submission or activities of users on the Site. Without limiting the generality of the foregoing, you acknowledge and agree that the information, materials and opinions expressed or included in any Submission are not necessarily those of the Company. Notwithstanding the foregoing, Company has the absolute right to monitor Submissions posted to the Site in the Company’s sole discretion. In addition, the Company reserves the right to alter, edit, refuse to post or remove any such Submissions, in whole or in part, for any reason or for no reason, and to disclose such Submissions and the circumstances surrounding their transmission to any third party. You agree that the Company does not have any obligation to use or respond to any Submission. • Do not post comments that are irrelevant to the issues and ideas being discussed directly on the Site. • Do not post content that can be construed as threatening, harassing, defamatory, or libelous. • Do not make statements that are false or misleading in nature. • Do not solicit offers to buy or sell products/services or otherwise attempt to engage in commercial transactions. • Do not post content that infringes on copyrights or trademarks. • Do not post information that you know to be confidential, sensitive or proprietary in nature. The Company accepts no responsibility for information posted in any Submissions. Please note that once you post a comment (or submit a Submission) to the Site, it becomes part of the public dialogue. Registration may be required for the use of certain portions of the Site, including, potentially, to post certain Submissions. Your registration shall not impose any duty on the Company to provide any particular service to you. If any unauthorized person obtains access to the Site as a result of any act or omission by you, you shall use your best efforts to ascertain the source and manner of acquisition and shall fully and promptly brief the Company. You shall otherwise cooperate and assist in any investigation relating to any such unauthorized access. The Company currently accepts compensation from online advertising through the Site. The Company currently does not accept money from companies for writing contracted reviews, positive or otherwise, for promoting any third party goods and services, or via referral fees from third party retailers. c/o Marc Jacobson, P.C. 244 West 54 St., 9th Floor, New York, NY 10019. 3. Company shall take reasonable steps to promptly notify the alleged infringer that it has removed or disabled access to the material. Released Parties are not responsible or liable in any manner for any Third Party Content on the Site, whether posted by the Company, by third parties, or by any of the equipment or programming associated with or utilized in the Site, or for any Third Party Sites. Released Parties do not control and are not responsible for Third Party Content and are not responsible for any harmful, inaccurate, deceptive, offensive, threatening, defamatory, unlawful, or otherwise objectionable content you may encounter on the Site or in connection with any Third Party Content. Released Parties are not responsible for the conduct, whether online or offline, of any user of the Site. YOUR USE OF THE SITE IS AT YOUR SOLE RISK. THE SITE IS PROVIDED ON AN “AS IS” AND “AS AVAILABLE” BASIS, AND THE RELEASED PARTIES DO NOT WARRANT THAT THE SITE (AND/OR ITS SERVERS), OR COMMUNICATIONS SENT FROM THE COMPANY OR VIA THE SITE ARE FREE OF VIRUSES OR OTHER HARMFUL COMPONENTS. TO THE FULLEST EXTENT PERMITTED BY APPLICABLE LAW, RELEASED PARTIES EXPRESSLY DISCLAIM ALL WARRANTIES OF ANY KIND, WHETHER EXPRESS OR IMPLIED, STATUTORY, OR OTHERWISE, INCLUDING, BUT NOT LIMITED TO THE IMPLIED WARRANTIES OF MERCHANTABILITY, FITNESS FOR A PARTICULAR PURPOSE AND NON-INFRINGEMENT. RELEASED PARTIES MAKE NO WARRANTY THAT (i) THE SITE WILL MEET YOUR REQUIREMENTS, (ii) THE SITE, OR THE SERVERS THAT MAKE THE SITE AVAILABLE WILL BE UNINTERRUPTED, TIMELY, SECURE, ERROR-FREE, OR FREE FROM VIRUSES OR OTHER HARMFUL COMPONENTS, (iii) THE RESULTS THAT MAY BE OBTAINED FROM THE USE OF THE SITE WILL BE ACCURATE, USEFUL OR RELIABLE, (iv) THE QUALITY OF ANY SERVICES, INFORMATION, OR OTHER MATERIAL PURCHASED OR OBTAINED BY YOU THROUGH THE SITE WILL MEET YOUR EXPECTATIONS, AND (v) ANY DEFECTS OR ERRORS OF THE SITE WILL BE CORRECTED. YOU EXPRESSLY UNDERSTAND AND AGREE THAT, TO THE FULLEST EXTENT PERMITTED BY APPLICABLE LAW, RELEASED PARTIES SHALL NOT BE LIABLE FOR ANY INDIRECT, INCIDENTAL, SPECIAL, CONSEQUENTIAL, OR EXEMPLARY DAMAGES, INCLUDING BUT NOT LIMITED TO, DAMAGES FOR LOSS OF PROFITS, GOODWILL, USE, DATA, OR OTHER INTANGIBLE LOSSES (EVEN IF THE RELEASED PARTIES HAVE BEEN ADVISED OF THE POSSIBILITY OF SUCH DAMAGES), RESULTING FROM: (i) THE USE OR THE INABILITY TO USE THE SITE; (ii) THE COST OF PROCUREMENT OF SUBSTITUTE PRODUCTS, GOODS AND/OR SERVICES RESULTING FROM ANY DATA, INFORMATION OR SERVICES PURCHASED OR OBTAINED OR MESSAGES RECEIVED OR TRANSACTIONS ENTERED INTO THROUGH OR FROM THE SITE; (iii) UNAUTHORIZED ACCESS TO OR ALTERATION OF YOUR TRANSMISSIONS OR DATA; (iv) STATEMENTS OR CONDUCT OF ANY THIRD PARTY ON THE SITE; OR (v) ANY OTHER MATTER RELATING TO RELEASED PARTIES. IF DESPITE THE LIMITATION ABOVE, RELEASED PARTIES ARE FOUND LIABLE FOR ANY LOSS OR DAMAGE WHICH ARISE OUT OF OR ARE IN ANY WAY CONNECTED WITH ANY OF THE OCCURRENCES DESCRIBED IN THE LIMITATION ABOVE, THEN ITS LIABILITY WILL IN NO EVENT EXCEED, IN TOTAL, THE SUM OF U.S. $100. SOME JURISDICTIONS DO NOT ALLOW THE LIMITATION OF LIABILITY, SO THE LIMITATIONS ABOVE MAY NOT APPLY TO YOU. Any dispute or claim relating in any way to your visit to the Site or to products or services sold or distributed by the Company or through the Site will be resolved by binding arbitration, rather than in court. Any arbitration will be conducted in New York, NY by the American Arbitration Association (AAA) before a single arbitrator under its rules. The Federal Arbitration Act and federal arbitration law apply to this agreement. We each agree that any dispute resolution proceedings will be conducted only on an individual basis and not in a class, consolidated or representative action. If for any reason a claim proceeds in court rather than in arbitration we each waive any right to a jury trial. We also may bring suit in court to enjoin infringement or other misuse of intellectual property rights. The Company may prohibit you from using or accessing the Site (or any portion, aspect or feature of the Site) for any reason, or no reason, at any time in its sole discretion, with or without notice. If you have any questions, please contact the Company: [email protected]. We are committed to protecting the privacy of our customers’ personal information. Accordingly, we have developed this Policy in order for you to understand how we collect, use, communicate and disclose and make use of personal information. From time to time, the Company may revise its Policy. Such revisions may be made at any time without notice and are effective when posted. The date of the most recent revision will be posted at the beginning of the Policy. Your use of this site following the posting of any amendment, modification, or change shall constitute your acceptance of thereof. We collect non-personally identifiable information about you in a number of ways, including by tracking your activities through your IP address, computer settings or your most visited URL. We may ask you to provide certain non-personally identifiable information about yourself, such as your age, gender, zip code, household income, and/or buying choices, etc. We do not collect any personally identifiable information about you unless you voluntarily submit such information to us, for example, by filling out a survey or resigtration form. The type of information that may be requested include your name, address, and email address. Before or at the time of collecting personal information, we will identify the purposes for which information is being collected. In general, we will collect and use personal information solely with the objective of fulfilling those purposes specified by us and for other compatible purposes, unless we obtain the consent of the individual concerned or as required by law. We will only retain personal information as long as necessary for the fulfillment of those purposes. We may use this information to deliver to you information about our company. Personal demographic and profile data is used only by the Company on an internal to tailor your experience at our site, showing you content we think you might be interested in. We do not share or sell personal information with advertisers or other third party marketers. Our site has put in place industry standard security measures to safeguard against the loss or theft, as well as unauthorized access, disclosure, copying, use or modification of the information under our site. While there is no such thing as “perfect security” on the Internet, we will take all reasonable steps to insure the safety of your personal information. We will make readily available to customers information about our policies and practices relating to the management of personal information. We are committed to conducting our business in accordance with these principles in order to ensure that the confidentiality of personal information is protected and maintained. By submitting photos, recipes, diy tutorials, or templates, you either have the copyright to said photos, recipes, diy tutorials, or templates, or that you have the authorization from the copyright owner to submit said photos, recipes, diy tutorials, and/or templates. Amy Atlas Events LLC, Sweet Designs, and Amy Atlas are not liable for any copyright claims from the true owner or anyone else. Our readers ask for styling tips and constructive criticism from Amy and any comments are intended solely to help readers and give tips. These are Amy’s personal styling tips and there is no malicious intent against anyone (including, but not limited to, any individual, religion, ethnic group, club, organization, or company, or anyone or thing. Amy’s comments/tips are purely personal and made with no malicious intent. None of Amy’s comments/tips constitute libel, and thus Amy Atlas Events LLC, Sweet Designs, and Amy Atlas are not liable for any case of defamation. Anything written on Sweet Designs is not to be taken as fact. If you decide to use tips, techniques, advice, and recommendations, and experiences damages, Amy Atlas Events LLC, Sweet Designs, and Amy Atlas are not liable. For giveaways, Amy Atlas Events LLC, Sweet Designs, and Amy Atlas are not liable for any claims from winners, including but not limited to, breach of contract, tortious interference with a business, intentional infliction of emotional distress, etc. Amy Atlas Events LLC, Sweet Designs, and Amy Atlas are not liable for any comments that others write on this blog. Comments are the sole responsibility of the comment writers.